Turning Point is India's Leading Defence Career Training Academy with a network covering the entire country. We are first of its kind in providing all types of coaching and training for defence related exams & Interviews(SSB, UPSC) for Armed and Para Military Forces. SSB Training is handled by a team of professional trainers, who are ex-assessors of various SSB Boards in the Country. We have well qualified & experienced team for each department who have broad knowledge of many Union & State level exams. We have a team of Ex- Defence Personnel to impart Exam training and Interviews. We train candidates to face National level Competition for all Types of Commissions like NDA & NA Exam, CDS Exam, CPF (AC), AFCAT, Army Techinal Entry Scheme, Naval Engg Entry, B- Tech Entry Scheme , ACC Entry, NCC Special Entry , TGC Entry etc. We have excellent training facilities and professional trainers for UPSC Entrance Exams such as NDA, CDS, SCRA etc and other Copetitive Exams like CAPF AC, SI, with well structured curriculum, mock tests, providing solutions of previous years question papers and consolidated study material and special spoken english classes for Hindi medium students. AFCAT recruitment 2019 Date for applying from 01 Dec to 30 Dec 2018. Dear Students, Indian Coast Guard recruitment 2018 official notification is out for post of General Duty, General Duty (SSA), Commercial Pilot Entry (SSA) & Law Officers. Last date to apply is 30 Nov 2018. The UPSC has released the notification regarding the UPSC Combined Defence Services (CDS) Examination 2019. the application process for CDS I examination has been started, and the last date for receipt of application is Nov 26, 2018. Exam date is 3rd February 2019. 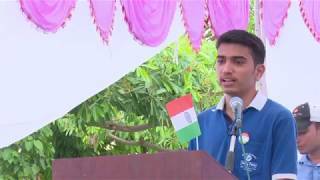 Independence Day Event : Tu Khud Ki Khoj Mein Nikal Kisliye Hatash Hai nicely performed by 1 of our Academy Student.Very Motivating Lines. Amandeep, a student of Turning Point Defence Academy got selected just after 12th when he completed his coaching for Airforce X group at Turning Point Defence Academy while staying at our Sitapura Academy.He is sharing his experiences in Hostel(Academy) & Coaching Center.